Here’s what’s happening in the world of television for Thursday, April 5. All times are Eastern. 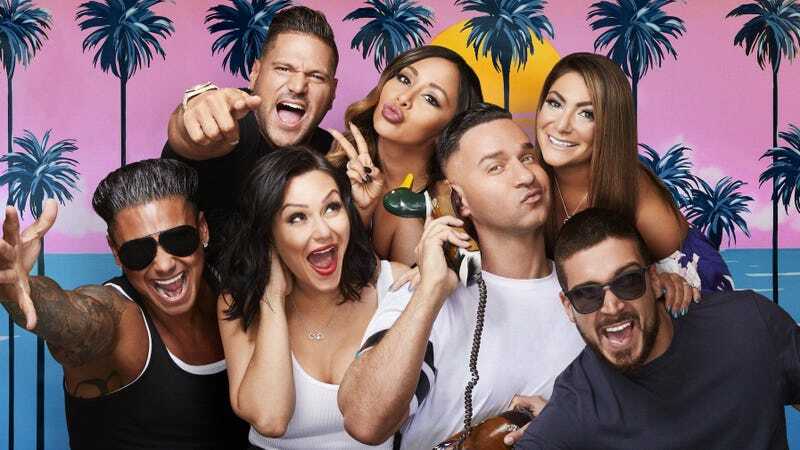 Jersey Shore Family Vacation (MTV, 8 p.m.): Nearly a decade ago, Music Television struck ratings gold, mixed it with an inadvisable amount of vodka, and then puked it back up on the beaches of Seaside Heights. And now, six years after Jersey Shore’s conclusion, the cable channel has reconvened its cast of overly tanned New Jersey doofuses in Miami for Jersey Shore Family Vacation. They arrive in Florida with wedding rings, high-profile tax-evasion cases, no Sammi, and none of their kids—it’s like The Big Chill with a lot less Motown and a lot more fist-pumping. And probably more puking. That seems like a given. Engineering Catastrophes (Science, 10 p.m.): According to promotional text, this series will “profile, investigate, analyze, and find solutions for the world’s most unbelievable engineering gaffes.” But what about… The Solution? Nope, sorry: He’s due to be sentenced on those tax evasion charges.